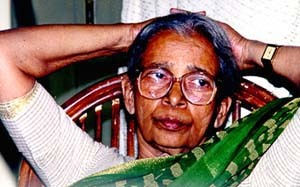 I’ll just tell Govind that I am giving this interview," Mahasweta Devi says, walking briskly out of the room at Bombay's Rajkamal Studios. Within minutes she is back, settles into a chair and asks, "Aren’t you going to take notes or use a taperecorder?" In Bombay for the first public screening of Govind Nihalani’s Hazar Chaurarsi Ki Ma which is based on her novel, the 71-year-old Bengali novelist has a rigorous schedule. But if she is tired, she shows no signs of it. On the contrary, the Jnanpith Award and Magsaysay Award winner has two more appointments later that evening, including an appearance on The Rediff Chat. 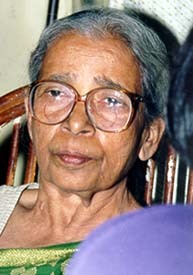 Unlike many Indian writers who prefer to observe the hurly-burly of existence from a lofty distance, Mahasweta Devi -- a former lecturer in English literature -- is actively involved with human lives. She has worked with the Kheria-Shabar tribals in Purulia, West Bengal, for over a quarter of a century and speaks of them with passion. Totally committed to their cause, she donated her entire prize money from the Jnanpith and Magsaysay Awards to the organisation she has set up for the tribals. 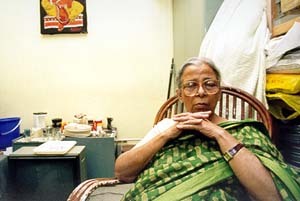 In a feisty conversation with Archana Masih, Mahasweta Devi speaks about her work with the tribals, the government’s attitude towards denotified tribes, Nihalani's film -- the third to be based on a novel of her's -- Calcutta and much more. I am working for denotified tribes. I don’t know any other organisation in India that is working for denotified tribes. After your long association with tribals in India, how do you see their situation today? The condition of the denotified tribes in India is very bad indeed. Only a few days ago there was this killing in Bombay allegedly by the Pardhi tribe, a tribe once notified as criminal and then denotified by the Government of India. Their condition is very, very bad all over India. Do you believe tribal lifestyles are under siege? The tribe with which I work is landless. To get even one meal is very difficult. Our organisation is not a foreign funded one. We do not accept foreign contributions. Most work is done by the Shabars -- the tribals alone. If you say tribal lifestyle, they should live naked, half naked in dilapidated huts. That way we are trying to change their lifestyle. (We see to it) that they are decently clothed, that their children do not remain naked and they have a livable hut. Do you think the Government of India has done enough for its tribal population? The Government of India has done nothing for the tribals. Why do you think the government – especially at the lower levels -- is so callous towards the tribal people? That I do not know, that you will have to ask the Government of India officials. How do I know? Why hasn’t 50 years of Freedom changed this mood of exploitation and deprivation? It has gone from bad to worse. Is it only because of the callousness of the government or are there some other reasons as well? I do not know what remains in the mind of the government. I do not belong to the government but I see the fact, the reality that it is going down to worse. Would you agree that tribals should be left insular to a certain extent? These are theoretical questions. What I think or you think does not matter, but it is true that the minimum human rights -- having roads, livable huts, drinking water; if they have land then irrigation; health, literacy -- they should get it. They are not only not getting it, increasingly tribals all over India are getting evicted from their land like anything. For any industrial project like dams that come up, tribal land is taken. When they take land, it is never land for land or money for land, so in this condition they become a nomadic migrant mass of people in search of work. Then they cannot retain anything of their own culture because all they are concerned with is ek waqt ki roti. Do you see the tribals getting fully integrated with the national mainstream at some point of time? Is it possible? Who tried to integrate them into Indian society? It is said they are cut off from mainstream society. Who tried to integrate them? And what is there so beautiful in mainstream Indian society that they should get integrated and lose their tribal entity? I don’t see it like that. I see that they get the minimum human benefit, food, electricity, water, education, work, training for women, for men also, childcare, ICDS centres. Things like that. And since many will not get job opportunities, it is best to make them self-employed by giving various kinds of training. In West Bengal, we have had a Santhal tribal world mountaineer. So given training, chance, opportunity, they can do anything. They have never been given any chance, so this question of keeping them apart does not come because mainstream society never wanted to give them anything. So what you mean is that these rights that are theirs should be given to them…? These are everyone’s rights. You live in a house. You have electricity. You can go to a hospital. You can take any job you want to, why shouldn’t a tribal be able to do that? These are the basic rights of every human being. Apart from the things that you are telling us, in your opinion, what is the best way of meeting the tribal cause, their needs? What do the tribals, in your opinion, need most? Security. Security that they are not evicted. Education, at least functional literacy. Drinking water, irrigation water, doctor and medicinal facility, crop training. These things. As you have spent a great deal of time with the tribals, have a good rapport with them and an understanding of their ways, what kind of attitude do they have towards people outside their society? They don’t trust them. They don’t trust them. For outsiders they show one face and their naked face is shown to people whom they trust. They trust very few people and I am very fortunate that I am one of them. How can they afford to be hostile? If they are hostile, the police will come. They will be cut off from whatever facility they get. I cannot talk of all the tribes, but what I have seen in the tribes where I work about them I can say. Are the tribals you work with anxious to integrate with the rest of society? Do they want to move out of tribal hamlets and get jobs in the cities? Yes, yes. If they get a chance, they work. Throughout the year they are working in somebody else’s fields, if the forest department gives them some work, if the village panchayat gives some work, they do it because they do not have any land. Purulia district is very dry. No rains, no water. So they work very hard wherever they find work. What are their ambitions, their goals? For someone who doesn’t know where the next meal is coming from they do not have any goals or ambitions. That way I have not talked to them. These are theoretical questions. These are questions from people who do not really know them. For people who do not know where their next meal is coming from, is it civilised to ask them that? Can I ask them what are their goals and this and that? How did you get involved with working with the tribals, how did it begin? Was it difficult to gain acceptance from them in the beginning? You see tribal rebellions are never mentioned in the history of the freedom struggle. This was the first time that the mainstream came to know about the tribal heroes, their rebellions. This gave them a sense of joy. Sense of pride in themselves. After that it became easy. They were coming to me, I was going to them. Whatever training we have given them -- para veterinary training... they have taken it very well and are practising it and are earning also. To the women we gave midwife training. They took the training very well and are earning also. Whatever literacy we have given them that has also found great importance. Fish cultivation, they are doing it most scientifically. Some tribals have land, and in a mono crop district they are growing two or three crops and are successful. After paddy, they plant potato, groundnut. They are learning vermiculture. Wherever there is a drift irrigation project, we’ve given it to the tribal boys and they handle this very well. So it is proved that they can do everything. Some 500 to 600 tribal families survive by making beautiful handicrafts. We gave them the training first, but now they are coming with beautiful designs. They make it with wild date palm leaves and wild grass.